Fuerteventura has a desert like scenery with some of the best surf in the chain of islands. A warm climate which is cooled by Atlantic breezes benefits the surfer greatly in the morning and late afternoon when the offshore conditions generate world class surf. Fuerteventura is considered one of the best places in Europe for heavy, uncrowded waves. If you are a novice then pick your surf spot carefully as some of the waves are unforgiving, breaking over shallow reefs with names like Suicides.However, there are surf schools where you can learn safety. (Be sure to learn the basic rules and surf etiquette before you go). Also, check out the different types of surfing waves. The most consistent surf is found on the north/NW coast with many spots ‘unridden’. There are waves to suit most standards of surfers but also some absolute gems for the more adventurous. The surf is pretty much divided into two main seasons – Autumn/Winter and Spring/Summer – much along the lines of the rest of Northern Europe. 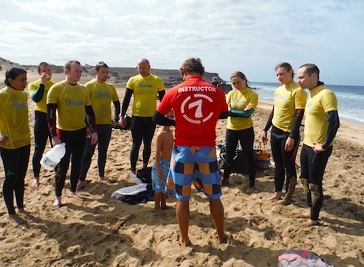 There are perfect breaks to suit all abilities and some top class surf schools for the total beginner. Swells come out of the Atlantic hitting the West and North coast with regularity. Occasionally large swells can wrap around to the island’s North East and South coasts. Your biggest consideration at these times will be swell size, wind directions and the size of your balls. As the swell wraps around the North, wave height diminishes slightly. So if El Hierro is maxed then there will be surfable waves at other spots further East such as El Muelle (The Harbour) or even Punta Elena (Rocky Point). When everything is maxed head to Flag Beach at mid to high or El Burro (Glass Beach) where occassionally the point can be small but fun. Traditionally the Sailing season, has now seeing the explosion of Kite Surfing. The Atlantic swells are often affected by a dominant high pressure system with a low over the african mainland heralding the North Easterly Tradewinds. This season’s surfing is not nearly as consistent as Autumn/Winter but there are still fun waves to be had predominantly on the East coast and at times the Cotillo region. Best for surfers who want a quick, warm, easy destination. Water Temperature can reach 22 degrees Centigrade. Some of the best surf areas on the island are to be found along the dirt road known as the North track. This road starts near the Bristol Playa Apartments in Corralejo, continues to the lighthouse near El Cotillo taking just over an hour to drive. The track is not the best of surfaces and beyond the small village of Majanicho it isn’t really suitable for small cars. So if you’re sensible you’ll hire a 4WD jeep. Remember there are no shops etc, so be sure to take a good supply of water and some food! Fuerteventura presents an arid, almost lunar landscape and is home to far more sandy beaches than the other islands. Strong winds are part of the deal, making this island a world-renowned windsurfing spot, but there are plenty of waves to be found in the calmer winter months. The north coast is packed with exposed reefs that pick up all the swells from W round to E and the waves range in intensity from the challenging tubes of Lobos to the mellow walls of Derecha de los Alemanes. 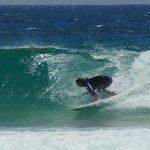 The long west coast offers open, rock-strewn beach break that is offshore in NE winds but anywhere south of Cotillo is isolated and currents can be extreme. The far south has a couple of quality set-ups waiting for the right conditions but it is a long drive down and the chance of getting skunked is high. The east coast is surfed up near Corralejo where bright white sands cover some nice little reefs and beginners can get some space but if the NEÕer is blowing then the wind and kite rigs will be flying all over the place. Summer can get surprisingly big on the east coast and there is potential for exploration but it is usually onshore. The depths of winter are going to be the best bet when the wind is lighter and more E than N. Early starts are advisable to beat the wind and the crowds, while siesta time matches the strongest wind period of the day. Summer can still have some good waves at the west and east coast beachbreaks. Learn to Surf in the sun with 7 Island Surf ! Join our team in Fuerteventura where we are blessed with year round sunshine, glorious white sandy beaches and warm turquoise seas. 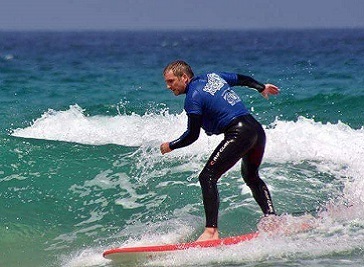 Since the beginning our philosophy is to provide our customers with professional and individual surf coaching to an international standard combined with a wide choice of surf-style accommodation.